With the poster for The Spy Who Dumped Me , we open on a lighthearted, humorous note—but the balance of this episode is rather somber, even violent, as we turn to Papillon, Searching, Active Measures, Alt-Right: Age of Rage, BlacKkKlansman, Laissez bronzer les cadavres (Let the Corpses Tan), and Floresta das Almas Perdidas (The Forest of the Lost Souls). The past two months have been exhausting and exhilarating. In September, the annual ATypI conference came to Antwerp, Belgium. Type Network foundry partners David Berlow, Ramiro Espinoza, and Underware gave remarkable presentations; Matthew Carter delivered a terrific keynote; and David Jonathan Ross received the prestigious Prix Charles Peignot. Thanks to Google’s sponsorship, you can watch videos of the talks on ATypI’s YouTube channel. After Antwerp, I traveled to Los Angeles for AdobeMAX 2018, where I talked about variable fonts and did an Adobe Live session with Ariadne Remoundakis for Behance. As you can see, you have a few videos to catch up on, but we’re gathered here today to talk about different types of moving pictures. Let’s take a look at some posters that have caught my eye since the last episode of ScreenFonts. We begin with the extensive promotional campaign for The Spy Who Dumped Me, an action comedy about two friends who unwittingly become entangled in an international conspiracy when the boyfriend who dumps one of the women turns out to be an actual spy. LA’s main theatrical one-sheet spoofs spy-movie tropes: aside from international locales and sharply dressed men, Kate McKinnon does the finger-pistol thing, and the scooter in the foreground is a far cry from the usual speeding cars, helicopters, and boats. The typographic lockup set in Aachen Bold is serviceable—the “THE” acting as the counter for the P is a nice detail—but the digital slanting distorts the letterforms and incorrectly redistributes the weight to the southwest and northeast corners. Matthew Carter’s Roster would have been a great alternative: it offers true italics, and the squarish counters in the round outer shapes create a powerful tension that would have given the overall image here some oompf. © 2018 Lionsgate. Key art by LA. Illustration by Allison Reimold. This makes my inner feminist very happy: not only is this a film with two female leads written and directed by a woman, but LA also commissioned an impressive who’s who of female artists and art directors to create alternate posters for the Artist Series advertising the film. There are too many to include them all, so I singled out the designs with the most interesting typography and lettering. Illustrator and art director Allison Reimold’s designs take up a sizeable portion of the gallery. Her take on the main poster shows how illustrations often do a better job of tying together all of the elements on the canvas than photo compositions. The painted art is a delightful throwback to posters for classic sixties spy movies, this time featuring real guns, balls of fire, and a speeding car. ITC Symbol Black is a sans with itty-bitty wedge serifs that harkens back to the eighties. It nicely complements the retro atmosphere of Reimold’s lively, lovely painting. Reimold’s playful, almost cartoon-like illustration in this alternate poster adds a dash of humor. Sans serifs with such pronounced contrast are rather rare; Monokrom’s award-winning, elegant Vinter is a magnificent example of the genre. © 2018 Lionsgate. Key art by LA. Illustration by Adrianne Walker. Art director and pop-surrealist painter Adrianne Walker deftly integrates the lettered movie title in the swirling dust kicked up by the scooter barrelling toward the viewer, while Kunis and McKinnon look on incredulously. © 2018 Lionsgate. Key art by LA. Illustration by June Bhongjan. Designer, surfer, snowboarder, and self-taught horticulturalist June Bhongjan created this delightful diptych, adorning Kunis’ and McKinnon’s upper body with a curly display script. Mark Simonson’s Parkside and Kinescope, as well as Jessica Hische’s Tilda, exude a similar aura. I would be remiss not to mention the other talented artists in this collection: Ana Cristina Galvez, Jessica Hong, Indie 184, Amanda Lynn, Monica Ahanonu, and Kelsey Beckett. Discover their beautiful visualizations of the movie in the Artist Series on the official movie website. © 2018 Bleecker Street. Key art by Bond. © 1973 Allied Artists Pictures. Key art by Renato Casaro. Because escape thriller Papillon is based on a forty-five-year-old cinematic classic, I was curious to see how its theatrical one-sheet compares to the posters for the original movie. I discovered that Bond’s key art resembles a poster by Renato Casaro, considered one of the most important, influential, and innovative Italian film-poster artists. In both designs, wrongfully convicted Henri Charrière and fellow inmate Louis Dega are portrayed in the shape of a papillon, the French word for “butterfly.” Casaro’s artwork is very graphic, with angular, strongly delineated shapes and a restricted color palette of predominantly green and beige. Bond’s design is more painterly: the butterfly silhouette is rendered in rough brush strokes and the saturated, lush hues belie the dourness of the storyline. Notice the running figure replacing the I in the movie title set in a squarish compact sans serif. Titling Gothic Compressed, Rhode Condensed, and Stainless Compressed also combine a fairly square bowl on the P with a low crossbar on the A. © 1973 Allied Artists Pictures. Key art by Tom Jung. Feast your eyes on Tom Jung’s expressive painting in the main theatrical poster for the 1973 original. The typeface for the film title and main actors is very close to the old ATF display sans Othello. © 2018 Screen Gems. Key art by Art Machine. Any poster that makes me do a double take automatically earns its place in ScreenFonts. Even though I instinctively knew their positions weren’t correct, I couldn’t stop myself from glancing down at my keyboard to see if the letters on the keys corresponded to Art Machine’s theatrical one-sheet for Searching, about a desperate father who—after his sixteen-year-old daughter goes missing—breaks into her laptop to look for clues that might help him find her. The typography in Art Machine’s other poster is conceptually sound: an I-beam cursor punctuates Neue Haas Grotesk (the superior Helvetica), as if the film’s title has been entered on a computer screen. Both designs display an intellectual crispness and formal clarity that is refreshing. © 2018 Screen Gems. Key art by P+A. The bizarre A in P+A’s alternate poster dumbfounded me until I realized that the peculiar crossbar forms an upward arrow. I understand what they’re going for, but the fact that it doesn’t resemble the conventional pointer at a 45-degree angle makes the concealed shape hard to decipher. If you have a weak spot for wide sans serifs like this one, have a look at Revolver Type Foundry’s Dinamit, or Font Bureau’s Benton Sans Wide or Titling Gothic FB Extended. Prefer a G with a simpler, spurless shape? Consider Anisette (set in all-caps). A smidgen squarer? Go for Stainless Extended. A little bit of contrast? Condor Wide has you covered. Things get grim and political with Active Measures, a documentary examining Russia’s interference with the 2016 American presidential election in collaboration with the Trump campaign. Given the controversial and volatile subject, it’s nice to see how restrained the festival poster is. The red line snaking its way through the concentric labyrinth, connecting Russian president Vladimir Putin to the White House, is an excellent metaphor for how Putin managed to gain a foothold inside the administration. Neue Haas Grotesk’s equally restrained letterforms are an obvious choice for a political documentary, but there is definitely room for alternative neo-grotesques, like Forma, Navigo, or brand-new addition to the Type Network roster Nitti Grotesk, for example. © 2018 Super LTD. Key art by Brandon Schaefer. In the spirit of the high-concept posters of the seventies, Brandon Schaefer’s main theatrical one-sheet adds some humor to the mix. A giant hand picks up the iconic roof of the White House, revealing the multi-colored towers and spires of the Kremlin palace. For me, the image recalls the delightful collage animations Terry Gilliam created for Monty Python. When I was young, the Communist-controlled Eastern Bloc was always depicted as grey and drab, while the Western world was supposed to be colorful thanks to advertising and, you know, capitalism. This poster shows the exact opposite: an explosion of vibrant colors emerges from the monochrome building. Thankfully, the designers stayed away from silly faux Cyrillic. Just like Gravillis Inc.’s key art for Siberia, which I discussed in August, Super LTD reached for a strict square design echoing the formal rigor of Russian constructivism. Agency Black Wide would have made a perfect substitute. Things get even grimmer and more polarized with Alt-Right: Age of Rage, which spotlights the rise of the alt-right movement in the first year of Donald J. Trump’s presidency. It focuses on the opposing efforts of anti-fascist activist Daryle Lamont Jenkins and alt-right leader Richard Spencer, culminating in the tragic showdown in Charlottesville. I was puzzled by the SXSW festival poster, designed by the filmmakers themselves, depicting an antifa protester throwing a molotov cocktail. It unnecessarily takes a side: by removing all context, the image erroneously paints the counterprotesters as the aggressors, a perception I doubt the documentary makers wanted to create. The main theatrical one-sheet takes a neutral position, successfully visualizing the rage from the title as an incandescent, red-hot abstraction. The use of blackletter, frequently (and somewhat incorrectly) connected to nazism and fascism, represents the extremist ideologies of the alt-right movement. The weathered texture reinforces the simmering intensity of the artwork. For the exuberant Saber, Zavier Cabarga mixed blackletter influences with uncial and Celtic forms, pairing them with ornate capitals. © 2018 Focus Features. Key art by Gravillis Inc.
Gravillis Inc. conceived a brilliant theatrical one-sheet for Spike Lee’s BlacKkKlansman, based on Ron Stallworth’s true story of how an African-American police officer from Colorado successfully managed to infiltrate the local Ku Klux Klan with the help of a white surrogate. The image of the police officer raising his fist as a symbol for black power and brandishing an afro comb while wearing a Ku Klux Klan hood had me laughing out loud. The incisive image proves that humor and laughter are powerful tools for countering racism and xenophobia—any type of oppression, really—because they punch up and mercilessly expose these reprehensible stances for what they are. The movie title is a perfect emulation of seventies display typography. Although I usually don’t condone digital slanting—see my remarks at the beginning of this post—there is absolutely no problem with slanting ITC Pioneer, since it consists solely of straight lines. This alternate poster does intriguing things with the stars and stripes. The photo of John David Washington weaves in and out of the stripes, as does the condensed sans serif. This makes the artwork look like a a collage and gives it a surreal atmosphere. © 2018 Kino Lorber. Key art by Gilles Vranckx. The grindhouse aesthetic for Hélène Cattet and Bruno Forzani’s Laissez bronzer les cadavres (Let the Corpses Tan) suits the movie to a tee: a bohemian writer, his muse, and a pair of gendarmes interfere with the plans of a grizzled thug and his gang to lay low on an island retreat with a haul of 250 kilograms of gold bullion. 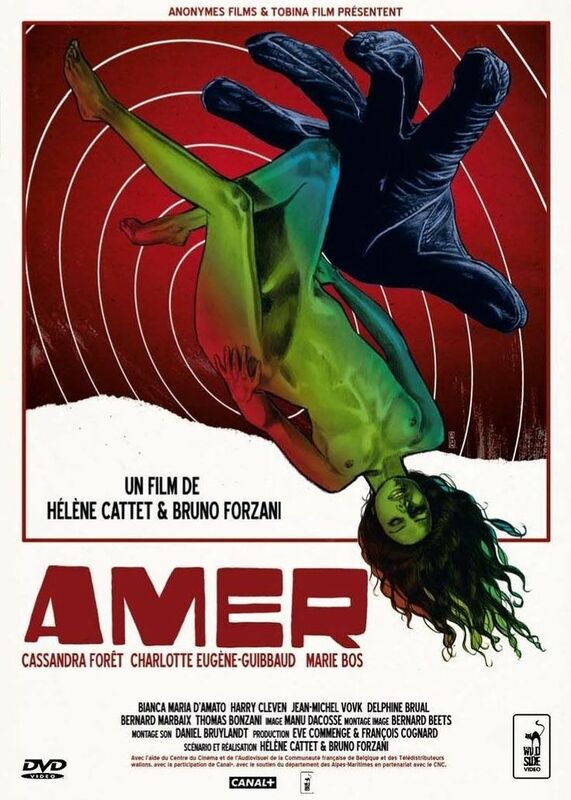 Belgian designer and illustrator Gilles Vranckx told me he has been designing film posters almost full-time since 2009, when he created his first one-sheet, incidentally for Amer, Cattet and Forzani’s first feature-length outing. After his initial attempts based on a rough cut of the film were deemed too western-like, Vranckx closely collaborated with the duo to meticulously illustrate and assemble the final artwork, down to every last rip and crease. The movie title set in a yellow slab serif refers to the source material: the film is an adaptation of a book from Gallimard’s Série Noire suite of post-war crime novels. A tear in the artwork reveals a plain black cover with bright yellow typography, the series’ original trade dress. I would have loved to have seen the film title set in Mønster or Trilby Black, as a gentle nod to the spaghetti-western atmosphere. © 2018 Kino Lorber. Key art by Jay Shaw. Mondo didn’t want to pass up an opportunity to support this independent production. Senior art director Jay Shaw created collage-like artwork, macabre and surrealist in equal measure, for his screen-printed alternate poster. The magnificent composition in red, gold, and black, complete with expressive brush lettering, channels a modern-day Salvador Dalí. The feature-rich Cortado possesses a similar casual-but-determined flair. © 2018 Anexo 82. Key art by Anexo 82. Named after Portugal’s most popular place for suicide, the horror mystery A Floresta das Almas Perdidas (The Forest of the Lost Souls) begins when two strangers meet within the dense and remote forest on a summer morning. Porto-based film-production company Anexo 82 mined the grim atmosphere, portraying the woman of the pair upside down to symbolize her emotional state. In one variant, the forest’s canopy is revealed inside the shadow portions of her hair; in the other, her hair morphs into a tree crown. The generic compact sans-serif typography seems like a missed opportunity. Its neutral look doesn’t add anything to the overall atmosphere. A more distinct type choice would have enhanced the emotional power of this poster. Finally, the darkly beautiful international theatrical one-sheet features a strong photographic composition, in which the woman’s torso transitions into writhing tree roots. The striking silhouette becomes a metaphor for her peculiar connection to the woods. The partially red roots mirror the blood on her hand and knife, an omen of her lurid intentions. I hate to end on such a downer, but it seems as if the recent Halloween period steered this month’s selection in a morbid direction. Don’t leave yet, though—the Leftovers are coming!